gallons of water every year, according to the EPA. And you'll save the energy it would have taken to heat all that water! 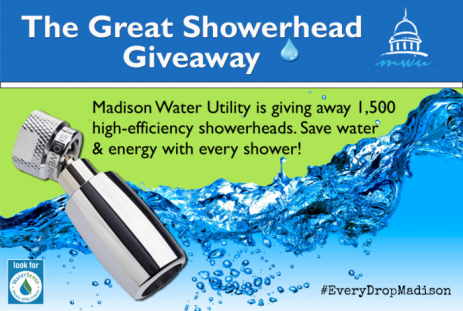 When: Saturday, November 19th, 9:00 a.m. to 1:00 p.m.
Where: Warner Park Community Recreation Center, 1625 Northport Dr.
Any leftover showerheads will be given away starting Monday, Nov. 21st at Madison Water Utility's 119 East Olin Ave. offices during business hours. Unlike most showheads, this small gadget creates a wide spray from a single stream of water. The design makes for an extremely compact showerhead that's less likely to clog because of mineral build-up. An internal pressure regulator works to keep the spray strength consistent. Solid brass and stainless steel construction. Made in Madera County, California.